Services | Garden Gate Nursery - Gainesville FL better selection. better advice. 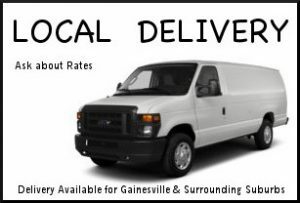 If you live within the greater-Gainesville market and the item requested is available at Garden Gate Nursery, you have the option of using Pick Up in Store or Local Delivery. Garden Gate’s Delivery rates vary depending on how far away you live from the store, but not by delivery weight. A customer service representative from the store can schedule deliveries for you. Call the store or request delivery at checkout to schedule a delivery time and determine the delivery rate. Did you know you can grow your favorite flowers and vegetables anywhere by planting them in beautiful containers that enhance the setting. For years, Garden Gate Nursery has been providing the greater-Gainesville areas with creatively designed planters and container garden ideas. How it works After finalizing the direction, one of Garden Gate’s horticultural experts hand picks each plant and installs the highest quality materials, making sure “it is the right plant for the right place.” We take into account lighting, watering, and seasonal requirement to make sure your new planters and containers have a long and healthy life with you! 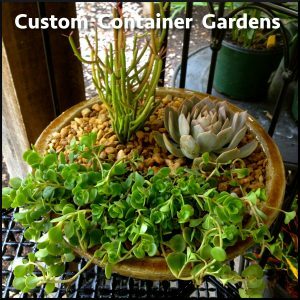 Ordering You Custom Container Garden A customer service representative from the store can receive orders for custom container gardens. Simply, answer a few questions about lighting, watering and seasonal requirements and then get the fun part of picking out the right plants for your new container garden. If your making a phone order, we can choose the correct plants for you – just give us as much detail as possible!